Your employees are busy, stressed, and overwhelmed. Fortunately, there is a way to grab their attention and remove external distractions. In this article, I'll highlight 9 visual elements that EVERY online training must have in order to engage corporate learners. There are a myriad of reasons to incorporate eye-catching visuals elements in your online training course. They help to simplify complex concepts, boost knowledge retention, and add more interactivity in online training, but screen space is limited. Thus, you must pick-and-choose your visual elements carefully. Here are 9 visual elements that no online training course is complete without. Fonts are one of the most overlooked visual elements in online training. We all use text to convey the key takeaways, but it can also set the right tone for your entire online training course, which is why it's essential to choose the right typography. It also has to align with your subject matter and learning objectives without compromising legibility. For example, an elegant or artsy font may reflect the sophistication of your brand. It may be difficult, though, for your corporate learners to read. The color of your typography can also help or hinder the effectiveness of the overall design of your online training course. Keep in mind that contrast is key. Opt for font colors that mesh with your existing palette, but they don't blend into the background. Images in online training create a connection with your corporate learners, but only if they tie into the subject matter and support the desired online training outcomes. For example, an attention-grabbing image may stir controversy and get your employees talking. However, it's more of a distraction than a valuable learning aid. Ensure that all of your images are relevant, relatable, and targeted to your audience. There are a number of free image sites you can use to enrich the online training experience. Infographics have been used in the marketing industry for years to highlight trends and showcase product benefits. However, they are also a great tool for online training tasks and topics. Infographics blend text with images to simplify complex subject matter. For example, a visual step-by-step guide for a work-related process. The key to creating effective infographics is sticking to the essentials. Just include need-to-know information to prevent cognitive overload and improve knowledge retention. Graphs and charts turn raw data into easily digestible visual elements. For example, statistics that stress the importance of adhering to safety protocols on-the-job. The mind is able to assimilate information more effectively when it's in a visual format. As such, bar graphs and pie charts improve comprehension. The key is adding pops of color, graphics, and other eye-catching visual elements to make them stand out. A black and white chart may be overlooked, but employees are sure to remember one that features bold hues and relevant images. Timelines are an absolute must for online training courses that involve historical data or trends. Better yet, create interactive timelines that feature pop-outs, hyperlinks, and images. For example, corporate learners click on the first date to access supplemental online resources, such as online training videos that discuss the significance of the event. Timelines are also ideal for task-based online training. Simply highlight each step of the process on the timeline so that employees can view them in a linear format. Employees need to know where they are going and where they've been. This fuels their motivation and gives them a sense of purpose during the online training process. It also helps them stay on track and monitor their goals. For example, they can quickly see which tasks they must complete in order to receive their online training certification. Include the progress bar on every screen to serve as a reminder and give employees that extra nudge they need. Navigation buttons are an integral part of your overall design of your online training course. Much like the progress bar, they provide employees with a clear direction; "clear" is the imperative word. Your navigation should seamlessly flow from one screen to the next. This involves familiar buttons and explicit online instructions. Social media icons are also an ideal addition to online training courses. They allow your employees to quickly access social media pages and groups, which facilitates online collaboration. Character cutouts, cartoons, and images add a human element to your online training course. Employees are more likely to connect with the subject matter when there is a character they resonate with. For example, a businessman who is facing the same workplace struggle or challenges. Take it one step further by adding speech bubbles to transform online characters into personal guides. There are some tricks to choose the best character images for your online training course. Ideally, the fictional character should have a relatable appearance, for instance, a mandatory work uniform. They must also align with the subject matter and core learning objectives. Last, but not least, menus are the most important visual elements to include in online training courses. They provide employees with a general overview of the online training activities, modules, and assessments they need to complete. You can even make your online menus more personalized by following a non-linear format. For example, employees have the opportunity to choose their next online training activity from a hyperlink list or themed map, such as a tree-inspired menu that branches off into different topics and tasks. Make sure your online menu is featured prominently on your main page, and that employees can access it at any point during the online training course. Keep in mind that visual elements are there to support the key takeaways. They should reinforce the subject matter instead of serving as a distraction. The golden rule of visual design in online training is less is more. Every image, graph, and button you include must have a purpose. Otherwise, you may end up with a cluttered design in online training that may cause cognitive overload. 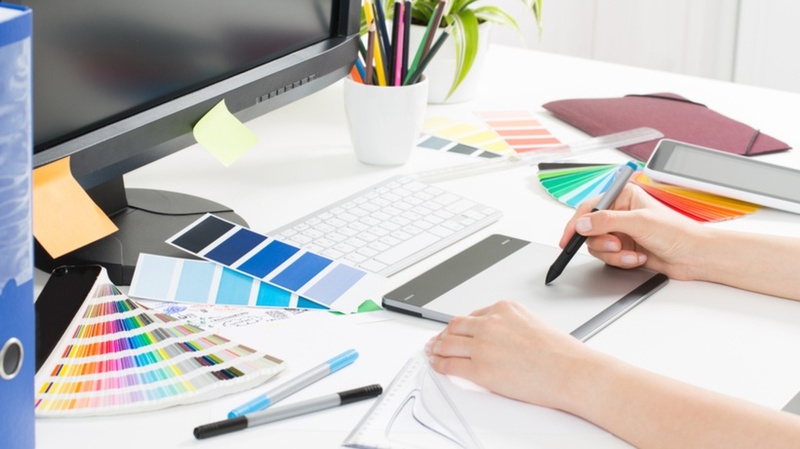 Do you know the basics of visual eLearning design? Read the article Top 5 Tips For Visual Design In eLearning to create an eye-catching, powerful, and immersive eLearning course for your audience.